So instead of condemning the parents in this scheme who are guilty of bribery and fraud, as the media has been doing, one should question why acceptance into universities is so hard to obtain in the first place. The selectivity issue is largely colleges’ fault. By emphasizing selectivity, colleges portray the education they offer as a rare good when it really shouldn’t be, enticing wealthy parents to obtain an elite degree for their children. While Dartmouth was not implicated in the recent scandal, it is guilty of emphasizing selectivity in the admissions process. 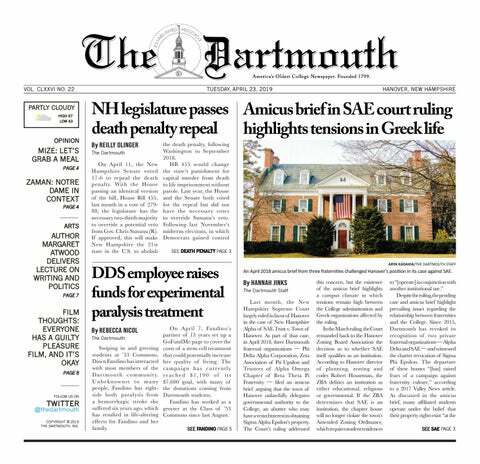 This year, 23,650 students applied to Dartmouth, decreasing Dartmouth’s acceptance rate from 8.7 percent to a mere 7.9 percent. Other elite colleges have followed the same trend; for instance, out of the 43,330 candidates who applied to Harvard this year, only 4.5 percent were accepted. These colleges would want one to believe that lower acceptance rates are only a byproduct of colleges’ search for the most brilliant students. But the truth is that colleges encourage more people to apply by using aggressive marketing and recruiting schemes. Each year, students with varying GPAs and other credentials receive floods of brochures from colleges encouraging them to apply. Why? Because perceived selectivity drives up alumni donations and generates funds through admissions fees. But acceptance rates don’t tell the full story to potential applicants. They may appear to be necessarily correlated with the quality of education a given institution provides, even though it is emphatically not. It is time that colleges stop focusing on acceptance rates and start improving the lives of their students once they’re accepted. While people attend college for a variety of reasons, the purpose of college is to provide high-quality education to promising young people, equipping them with the skills and knowledge necessary to solve the problems of a changing world. With the current nature of the admissions system though, colleges are missing the mark.